Located near Les Halles, the apartment is perfect for couples, opera artists, trainees or students who wish to stay in the heart of the city On the 1st floor of an old mansion, it can accommodate 2 beds. On an area of ​​30 m2, it has a main room with a mezzanine of 9 m which includes: - 1 double bed - 1 sofa bed with 1 extra bedding - 1 bathroom with shower - separate toilet - 1 kitchen - 1 dining area with a table - 1 seating area with a TV with cable channels - 1 small balcony The studio has air conditioning, very convenient. Linens, dishes and small appliances (vacuum cleaner, toaster, washing machine, ironing board and iron) are provided. You will be charmed by the setting of this old mansion that belonged to King René. Loved this charming apartment in the center of Avignon. Straight across the street from Les Halles and a short walk to all the sights you'll want to see. Louise was a fantastic host. I would stay here again. thank you very much for staying in my apartment. Abby is a charming and pleasant person. I had a lot of fun getting to know him. We enjoyed our stay very much. We arrived by train, and it's an easy walk from the station. While small, it had everything we needed (OK, maybe a few more knives, and I would have expected TP.) We are continually amazed at how European apartments are retrofitted into ancient buildings; it was indeed part of its charm - we loved the high wooden ceiling. That being said, be aware that the bathroom sink and 2x2 ft. shower are in a tiny space and the toilet is across the hall, right inside the door. The bed was comfortable and it was nice to have a sleeping space separate from the rest of the living area. The location was perfect, across from Les Halles market, where we shopped several times for produce and bread, and Place Pie, where there is an abundance of cafes. Everything in Avignon is within walking distance. Louise was a great host, easy to communicate with. She even helped me up the stairs with my too-heavy bag. We would definitely stay again. Couldn't have asked for better location and the owner was extremely helpful in every way. It was a terrific base for a memorable week in Avignon. Close to all major sights and Les Halles!!! There's 3 of us and we stayed 3 nights in this apartment. We loved Avignon and the apartment is conveniently located between the train station and the main sights, with the Tourist Information office being convenient too. Only up one flight of stairs, which was a welcome change from other apartments we rented in Europe. The owner is very friendly and accommodating. Overall it's an awesome value for the money. It would be better for guests who don't need to use the sofabed though. Tip: We got lost on the way to the apartment because Google maps suggested cutting along lots of little streets in the old town. We should have stayed on Cours Jean Jaurès/Rue de la Republique until we got to the little triangle park with the fountain (Rue Théodore Aubanel I think) then it's more-or-less straight until Rue de la Rene ends. This location of this apartment is ideal, a short walk from the train station and from the main tourist sights. 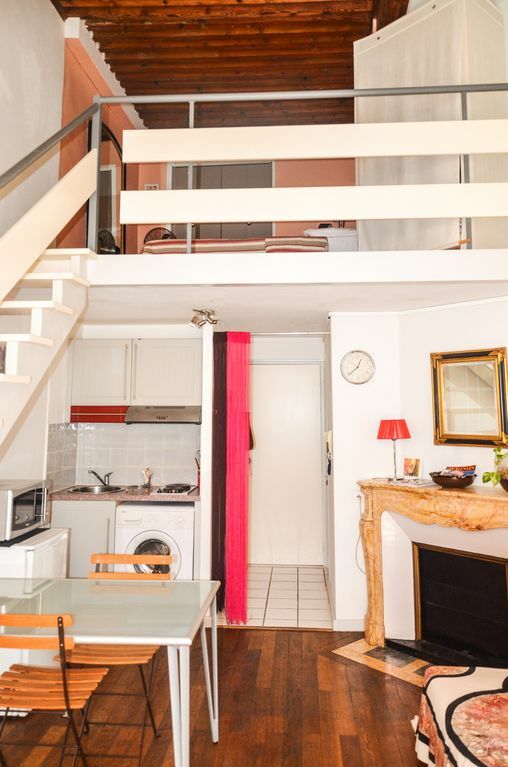 Les Halles is just outside the door and the apartment is surrounded by great restaurants and shopping. The apartment itself was spacious for two people and had everything we needed for our four night stay. There were a few downsides. The owner added a 30 Euro cleaning fee to our stay after we booked and paid a 50% deposit. This is a 15% increase in the price we were given when we chose to book the apartment. When we arrived, we were told that the internet wouldn't work for the first day and, once it was working again, not to expect it to be very fast. This was frustrating, as we rely heavily on having internet where we stay while we travel, both for working out the daily details of our trip and for my husband. Finally, there was construction on the road directly outside apartment window, which was incredibly loud beginning at 7 a.m. each morning. It also created dust and dirt that made opening the window during the day impossible. While it was nice having the option to run the air conditioner, the weather wasn't warm enough to need it, which meant the apartment felt stuffy most of the time. Overall, it was a great location for a great price and we enjoyed our stay, but we probably would stay elsewhere if we return to Avignon. I thank Holidaymaker that allows me to make the following clarifications. Housekeeping is shown on the ad in additional info. When a holidaymaker made a booking site does not add the cleaning fee. as I add them, and the vacationer can choose to accept or not. the reservation is final until payment is made. For noise, the work of the water system was conducted by the city of Avignon week of their stay. For internet, When we arrived at 16h and exceptionally, internet was available the next morning. We enjoyed staying at this lovely apartment right down the street from Les Halles indoor market. We had everything we needed; comfortable beds, nicely equip kitchen, washing machine. Within walking distance to so many restaurants, tourist attractions, grocery stores as well as other stores. We enjoyed meeting Louise, she was very helpful getting us all settled in. It was the perfect set up for my husband, daughter and I. In the center of Avignon, the studio is 5 minutes from the historic center with the Opera, the Palais des Papes and the Place de l'Horloge. An ideal location to explore this World Heritage city of UNESCO and visit the Festival. You will be close to all the shops and restaurants.